If you are cooking the turkey for Thanksgiving this year and are looking for a fail proof method for a super tasty turkey, this is it. Look at that bird! It was tasty. Very tasty. And very easy to cook. We had an extra turkey in our freezer and wanted to cook it a couple of weeks ago, so I thought I would document the process for all those in charge of cooking the bird this Thanksgiving. 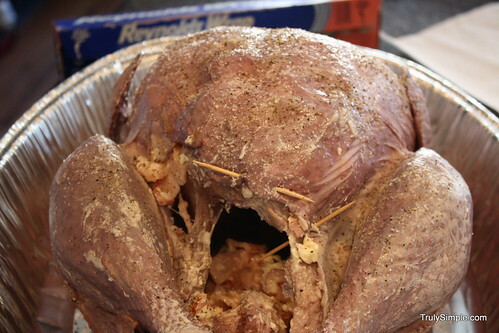 And the time to start this process is NOW, because you have to soak the turkey in a brine. Here’s what you’ll need to do it. 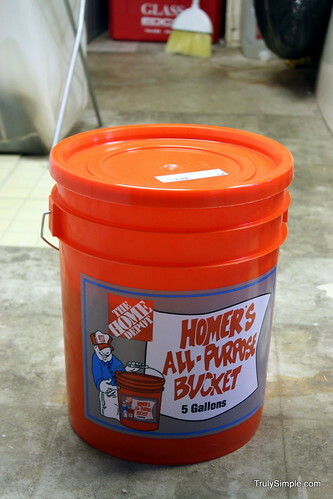 First, you need a clean bucket. Got this one from Home Depot as you can obviously see. 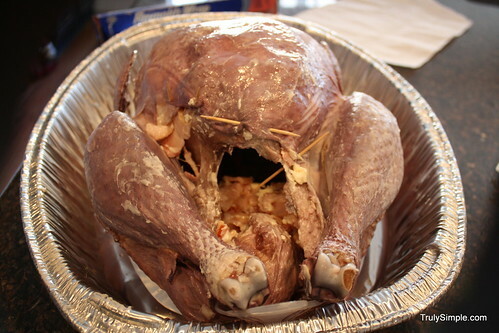 Clean it out and throw the turkey in. Then pour in 1 bottle of red wine, pick your favorite kind. That is where you get the lovely purple color. Also chop up one onion and several stalks of celery and throw those in. 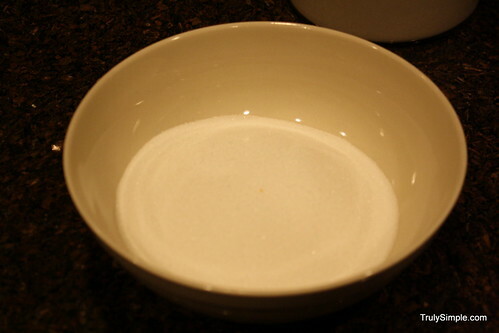 Then add a couple of cups of course rock salt. You can use kosher salt if you have that. 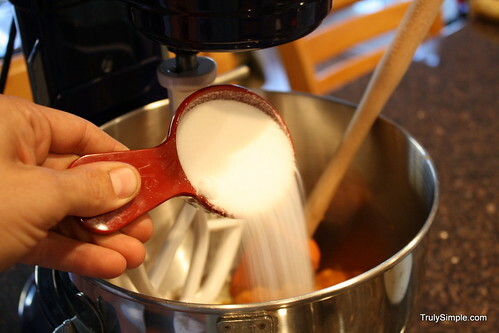 Then fill up the bucket with water to cover the turkey. That’s it. Throw it in the fridge and let it soak for a day or two. 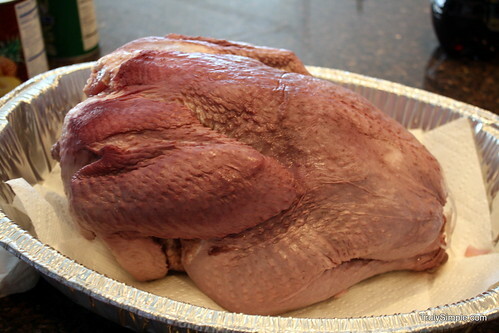 When you get it out of the brine, your turkey will be bright purple. DON’T FREAK OUT. It’s OK, it will not be purple when you are done cooking it. Now when you are ready to cook it we need to prep the bird. This is very easy. 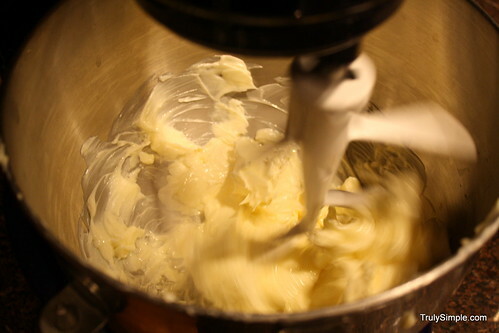 You will need 2 sticks of butter, softened, and a package of bacon. 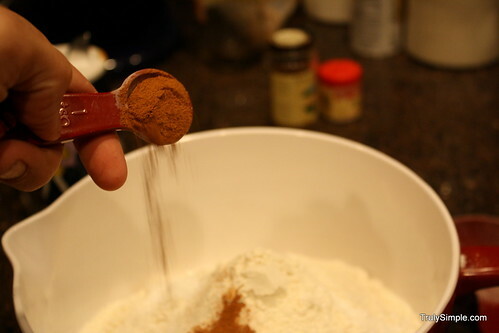 You can now start to see why this recipe is so awesome. 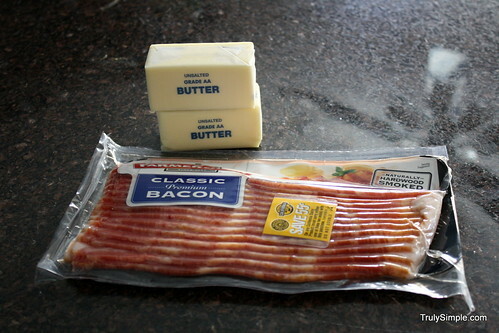 What is better than butter and bacon? 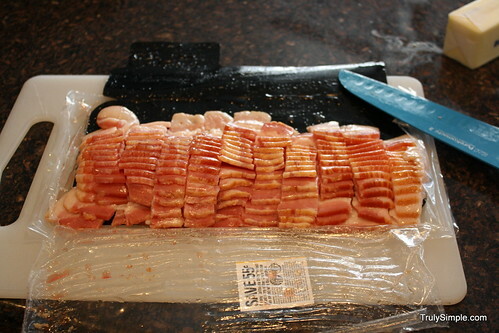 The key of this turkey recipe is to get all of that awesome buttery-bacon goodness under the skin. This part is a little gross, but it is easy. Wash your hands and dive in. Lift up the skin and run your hands carefully under the skin separating it from the bird but be careful not to rip or tear it if possible. Get all the way in there as far as you can. 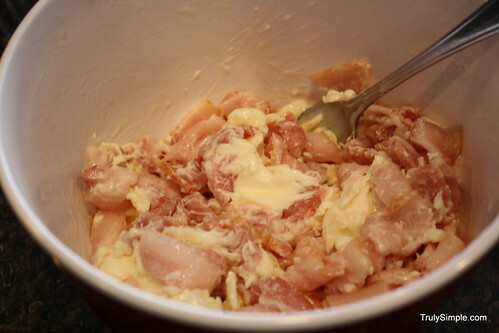 Stuff the butter bacon mixture into all the nooks and crannies under the skin. Then pin down the back of the skin with a toothpick or two to keep all t hat good stuff in there. Rub your hands an any excess butter all over the outside of the bird and then sprinkle liberally with salt and pepper. 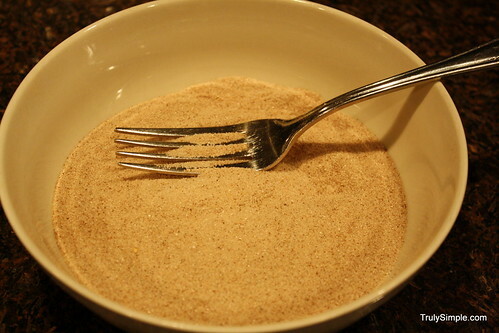 Here is the next trick. Flip the bird over so the breasts are facing down. 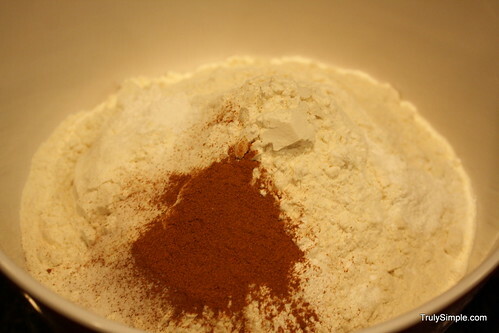 That is how you will be cooking it for first part. 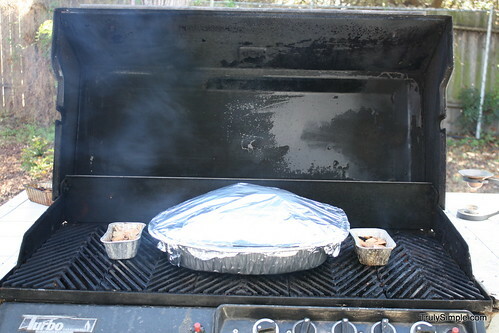 If you have a big BBQ, this is how I like to cook my turkeys. If you don’t, you can use an oven. Just follow the directions on the turkey. Here is how I do it. Get the BBQ hot. All burners on high. 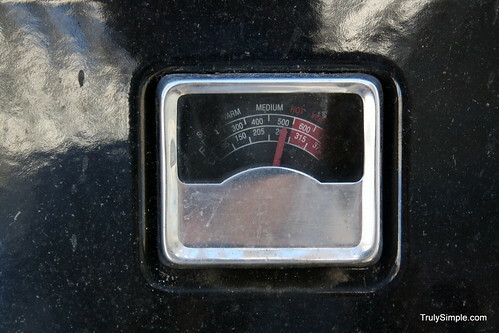 When it is hot, throw the bird in and turn down all the middle burners to low and keep the outer burners to medium. You want indirect heat here, which means you don’t want the heat to be directly below the turkey. Throw in some wood chips for good measure. 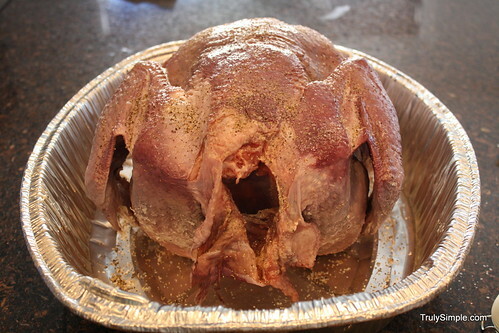 Also cover the bird with tin foil and let it cook at a medium heat (350ish). After an hour and a half flip the bird over so breast side is up and finish cooking the rest of the way. One of the reasons I like cooking in the BBQ this way is it only takes 3 hours to cook a turkey instead of the suggested 4-6 in an oven. 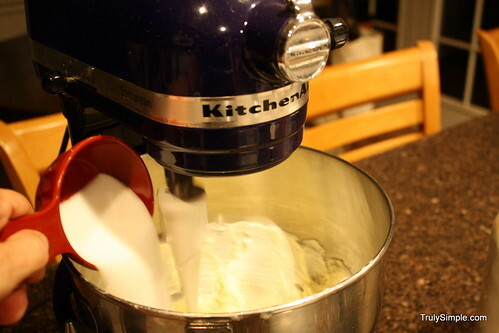 Super moist and super easy. 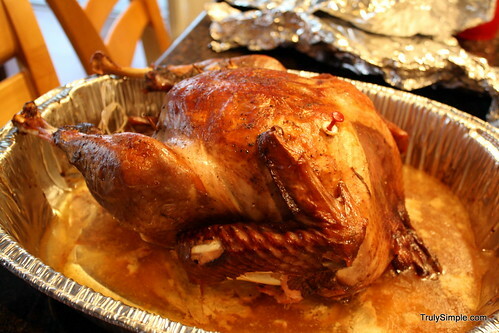 Pull the bird out of the BBQ or oven and behold your amazing skills as an expert turkey cooker. 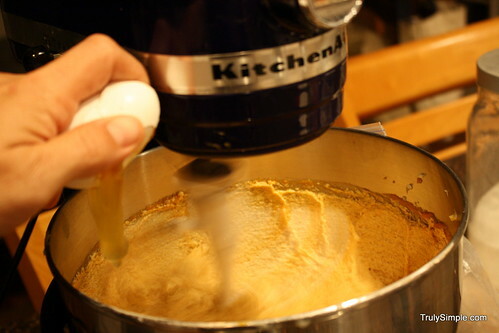 All of the good drippings around the turkey are great for making gravy. There you have it. Very simple, very tasty. I’ve tried several ways too cook turkey, including the oven, deep frying etc, but the BBQ is my favorite way. 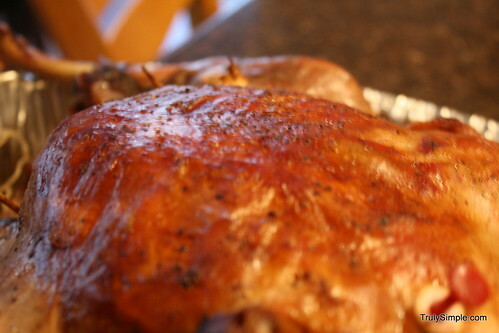 Plus it free’s up your oven to make other holiday dishes. Have a wonderful Thanksgiving everyone and remember to take a moment to pause and be grateful for all that you have and also give back to those who might be in need this year. 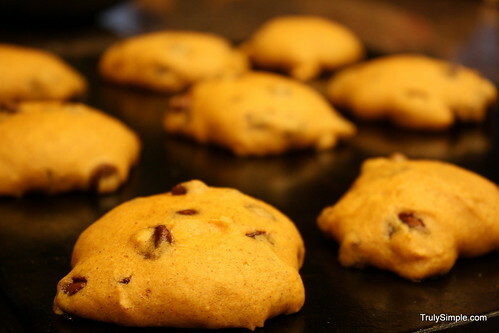 As I mentioned in the Pumpkin Chocolate Chip Cookie post, I LOVE PUMPKIN! 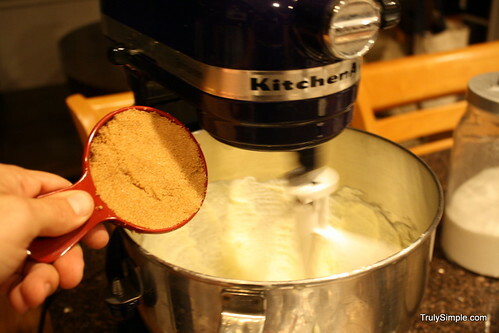 So in continuing with that theme, my wife saw pumpkin snickerdoodles somewhere and suggested I make some. so I did. And it was a brilliant idea. This is a great twist on an already awesome cookie. 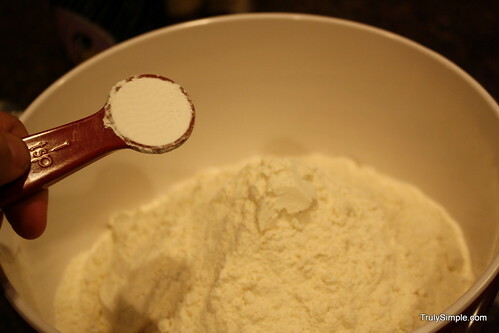 Here is what you’ll need to make them. 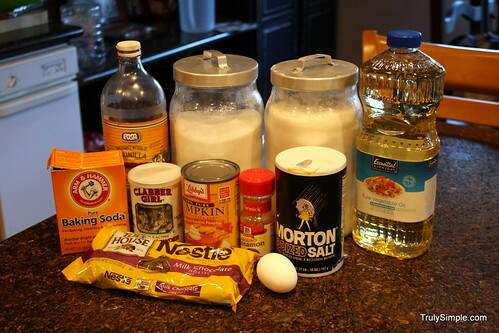 Mix all this stuff together and add it to your mixture in your mixer. 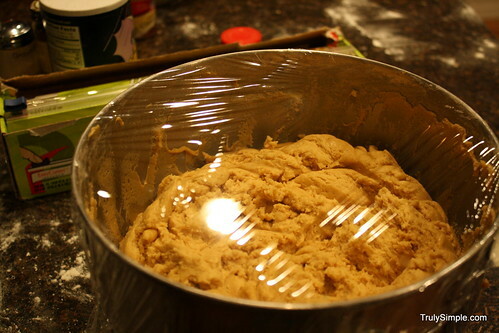 You will have this wonderful dough mixture that you can’t do anything with yet. 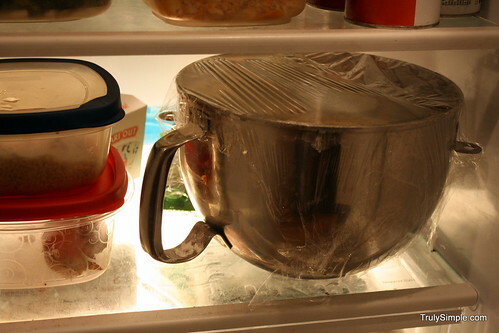 Cover it and throw it in the fridge for an hour. 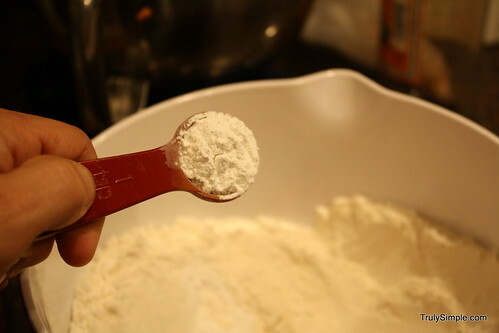 You can also make this ahead of time and keep in the fridge for a few days or freeze it even if you need want to have some cookies at a later date. 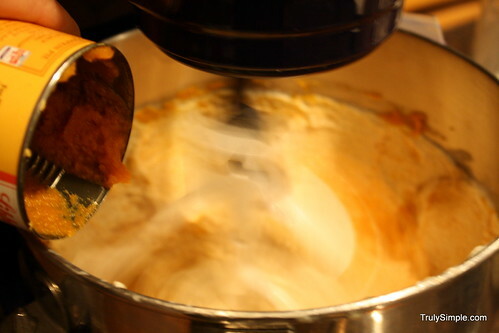 And mix it all up into this awesome mixture. 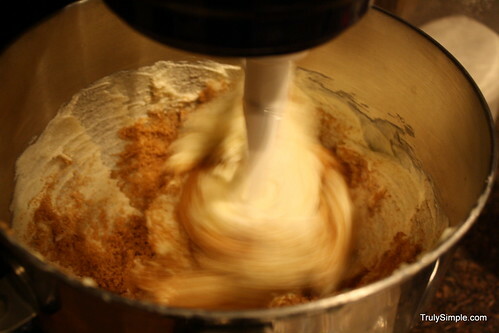 When the dough is ready wash your hands and get rolling. 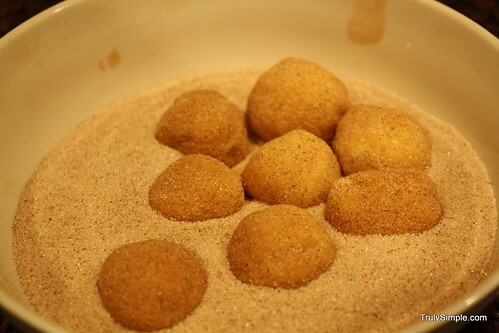 Make up some balls of dough and throw them in the coating and mix it up. Preheat your oven to 350 at this time too. 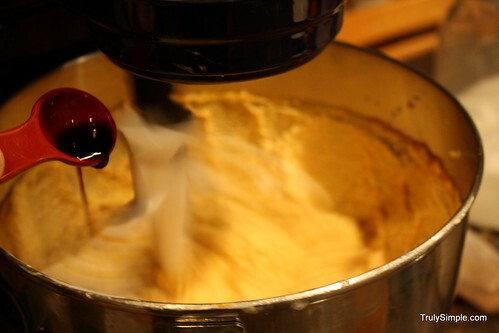 and you will end up with THE perfect fall time cookies. These also make the house smell amazing. 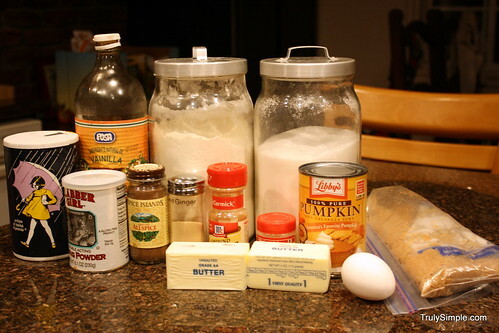 If you are looking for something new to make for Thanksgiving this year, this is it. 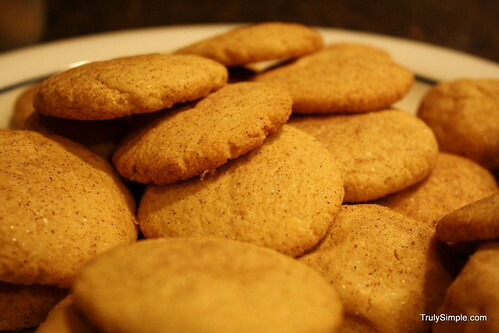 Enjoy these cookies. This is what Thanksgiving is all about. Fall is the best time of year because of of one simple reason. Pumpkin. Pumpkin pie, pumpkin smoothies, pumpkin everything, and it is wonderful. 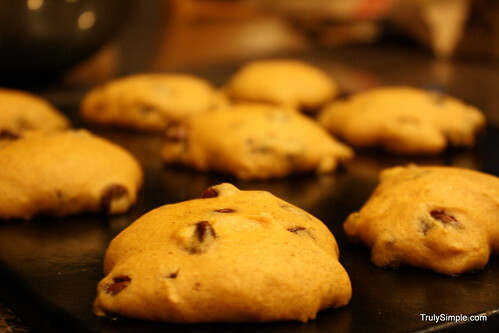 I love pumpkin and I love pumpkin chocolate chip cookies and you will too. 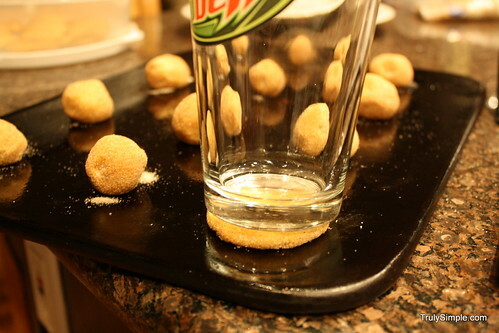 These are very easy to make, and here is how you do it. 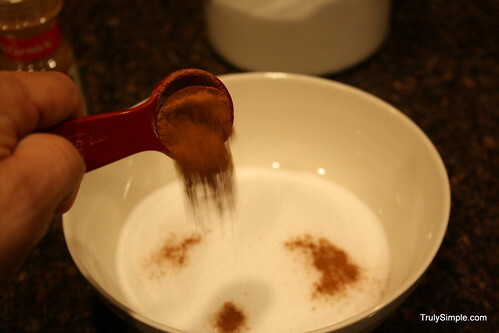 add 1 cup white sugar and mix all that together. 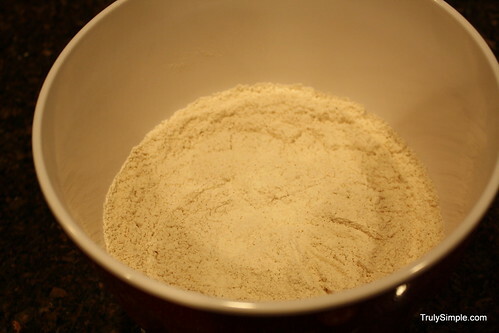 In a separate bowl we are going to add all the dry ingredients together. 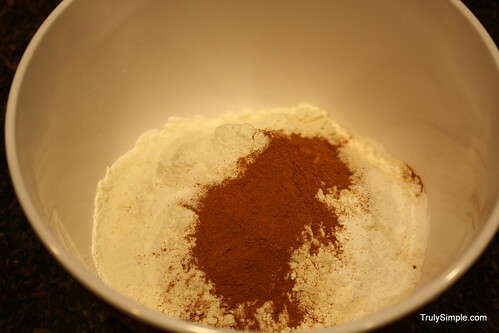 Stir together flour, baking powder, ground cinnamon, and salt. 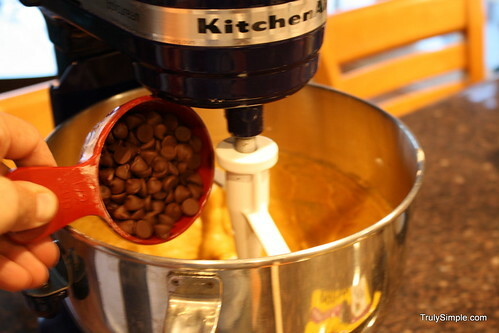 When its all mixed up add the 2 cups of chocolate chips and mix it up. 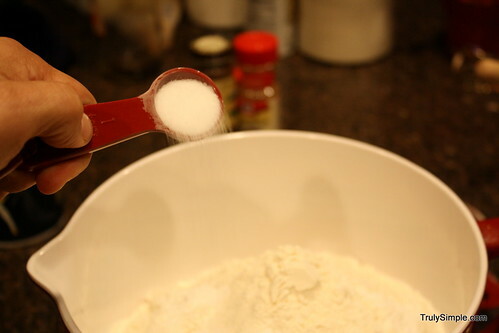 Spoon out the cookies onto a greased cookie sheet and bake at 350°F for approximately 10-12 minutes or until lightly brown and firm. 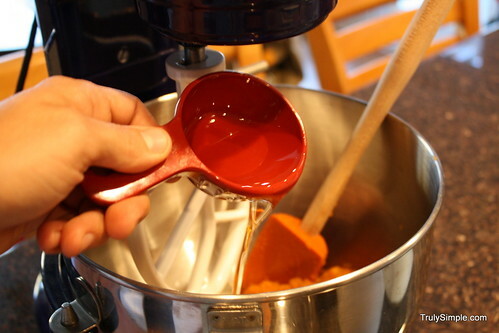 They will come out like this in all its pumpkin glory and everyone will love them and thus love you for making them. Plus it makes your whole house smell like pumpkin, which is never bad. 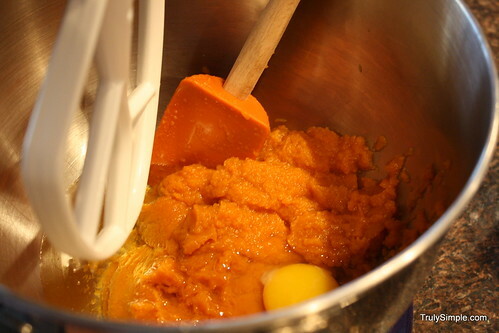 I doubled the recipe to use the entire can of pumpkin, which may or may not have been a good idea, but it sure did make a whole ton of cookies! Luckily I just send them to work with my wife and all the people in her hospital love her for it. 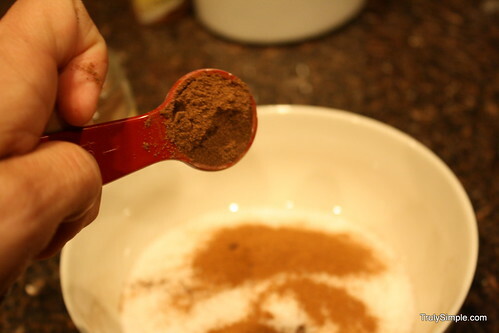 If you are looking for a good desert to make this fall, this is always a good one to make. 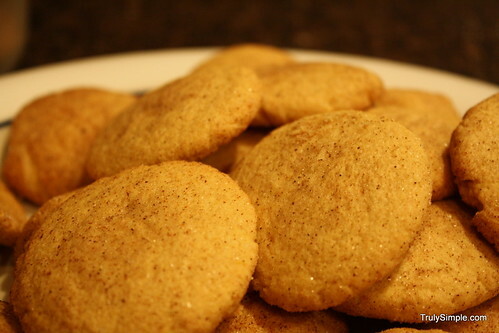 Also if you want to try something AMAZING, try the Pumpkin Snickerdoodles. 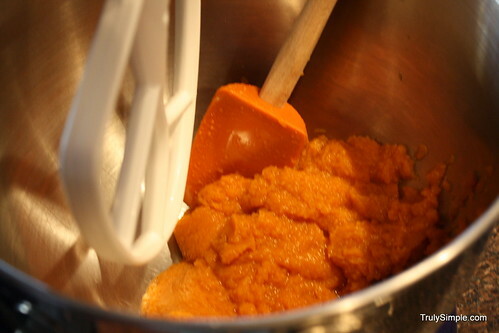 If you’ve got a good pumpkin recipe, please send it over. I love pumpkin!! I think it turned out even better than mine! 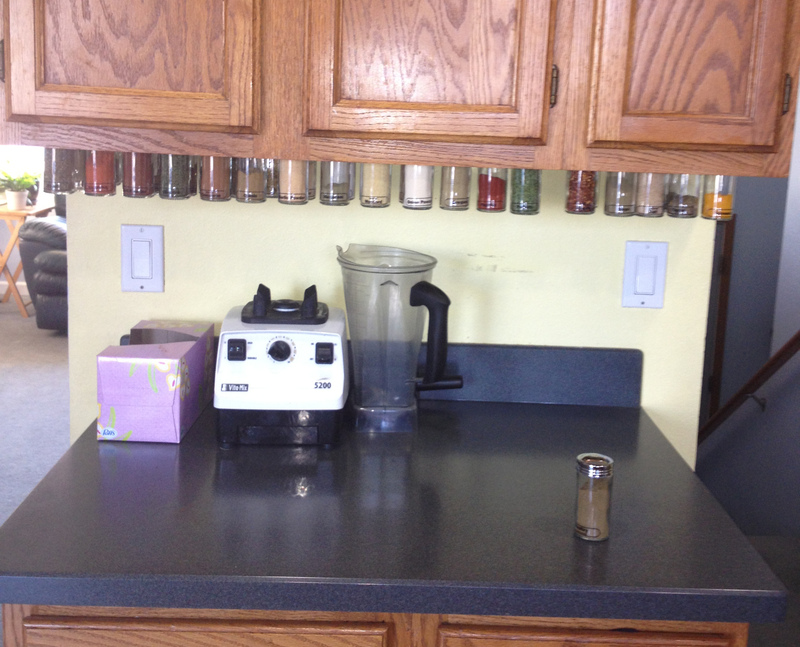 I love seeing all those spices in a row under the cabinet. Great job Jill and thanks for sharing! 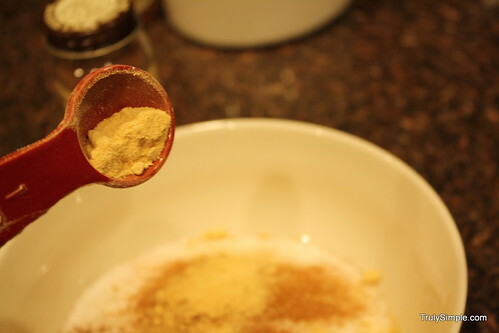 If you want to free up some cupboard space with all those spices and make something awesome, check out the step by step guide. This TSA (Truly Simple Actions) project started one year ago and it is fitting that it ends where it started. The goal of the this TSA project was simple. To help make this world a better place and improve our lives, one simple action at a time. Each week + one thing = life better. 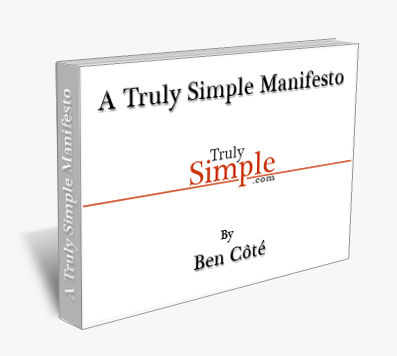 Each week I suggested to you, a simple action you could do that will improve your life and that of those around you. That was the plan and I hope you took the time to follow through on a few of these, hopefully more. Some of these have been simple little things for yourself, and as it started some of these are about helping those around you. 52 weeks later, here we are. I wanted to conclude this project just as it started, by helping out someone who needs it. As we head into the holiday season there are some around us who are struggling more than we are. My favorite TSA’s have been the ones where we get to help those around us. There is no better feeling than helping someone who needs a little help. So with that, your final TSA of 2011 is to make life a little better for someone around you. Friends and Helpers is an amazing charity that helps women and children who are trying to escape from a horrible situation at home. These families are escaping domestic abuse and are trying to start over and often times leave their current situations with only the clothing on their backs. Please consider adopting a family or a stocking to get them the very basics of what they need to survive and maybe even a present for their children to open on Christmas. 100% of any money donated goes to the families. Please consider helping them today. The second way to help is the Rolling Jubilee project. buys debt for pennies on the dollar, but instead of collecting it, abolishes it. Together we can liberate debtors at random through a campaign of mutual support, good will, and collective refusal. It is so simple and the math is astounding as far as return on investments go. For example $25 abolishes an estimated $500 worth of debt. Imagine a family struggling under a mountain of debt from an unplanned visit to the emergency room. They don’t have the $500 dollars to pay off their debt and they are hounded by harassing phone calls and subjected to high interest rates and additional penalties and fees, but if you could donate $25, you could wipe out that debt, forever. Now that family, free from that burden, can hopefully donate back to the project themselves and help free others from their debt and keep the cycle going. Please consider helping change someone’s life forever and donate what you can. Those are only 2 suggestions for how you can help someone this holiday season. There are thousands of other worthy charities and other simple ways you can help your friends and neighbors. Please take a minute right now and write down on a piece of paper either the name of one person or family or charity you can help this holiday season. Put that piece of paper in your pocket and think about it until you have taken the simple action of helping. Sometimes we all need a little help now and again. Take a few minutes this holiday season and help out where you can. Now to sing you off, here is Mumford and Son’s singing With a Little Help From My Friends live from the Hollywood Bowl last night. Best. Concert. Ever. Thank you so much for taking the time to read this and all of the other TSA’s (links to all of them below). They have made an impact in my life and I plan on continuing this tradition starting the first week in January and I hope you will join with me again. I’d love to hear from you if these have made a positive change in your life or if you have a good suggestion for a new TSA. Let me know in the comments or you can send me an email and let me know how these worked out for you. TSA#48 – What are you watching?